The 2017 Mummers Parade boasted more than 10,000 participants on Jan. 1. The annual festival is a century-long tradition that takes place along Broad Street in Center City. Love it or hate it, the Mummers Parade is the cream of the crop in terms of holiday parades, at least according to a poll by USA Today. As part of the newspaper's Reader’s Choice 2017 honors, the Mummers were voted number one in the Best Holiday Parade category, beating out Detroit's Thanksgiving parade and Baltimore's Christmas parade for the top spot. 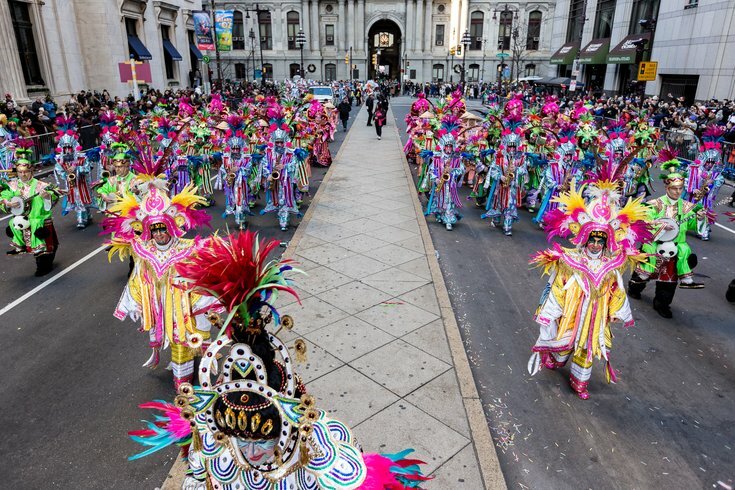 The Mummers Parade is believed to be the "oldest continuous folk parade in the United States." Known for its garish costumes, outlandish skits and big, brassy string band performances, it culminates with a "Show of Shows" at the Pennsylvania Convention Center. After the daytime parade down Broad Street, the Mummers head to Two Street (where many of the brigades' clubhouses are located) for a party to end all parties, as they strut into the South Philly night in a sea of music and alcohol. Of course, the parade and its participants have come under scrutiny over the past few years for controversial costumes, sketches and signs. There was the sign in 2016 that was "hurtful" toward transgender individuals, as Mayor Jim Kenney put it. That same year, a gay man was beaten by men in Mummers gear. Counter-marchers rallied against the 2016 parade, with organizers calling it historically "a racist, white parade." Such criticism is rooted in the history of using blackface among some Mummers. The practice was banned more than 50 years ago, but it has appeared in the parade in recent years, and some skits, floats and costumes have been denounced for being insensitive to Asian Americans, Hispanics and other minority groups. OPINION: Should Philly be more embarrassed of the Mummers or Wing Bowl? The Mummers have taken steps to try and address the backlash. In 2015, they began accepting ethnically-diverse groups to perform. After 2016, organizers launched new efforts to promote inclusivity and education among its members. The goal was to show, as a whole, the Mummers "categorically reject expressions of hate and bigotry." Last year's parade, by most accounts, was milder than years past and took place with relatively little controversy. Whether that trend continues in 2018 remains to be seen.